Fisker Karma | What Car? If only because he used to be a designer at Aston Martin, Henrik Fisker's creations deserve attention. Now based in California, he builds his own-brand cars, and at the Detroit motor show he has unveiled a high-performance four-seater hybrid that puts his company at the forefront of lithium ion technology. A petrol engine, the details of which have yet to be finalised, is linked with the hybrid system, which gives the car a total range of 620 miles, 50 of which are achievable in electric mode only. The Karma's battery can be recharged in five hours. Offering maximum torque from zero revs, it travels from 0-60mph in 5.8sec and has a top speed of 125mph. There are two driving modes: Stealth runs the car as economically as possible, while Sport gives the driver access to all the car's power, with the engine making a sound that Fisker describes as 'being somewhere between an F1 car and a jet plane'. Other features include regenerative brakes to help charge the batteries, and the option of roof-top solar panels to help power various instruments, including the air-con system if installed. 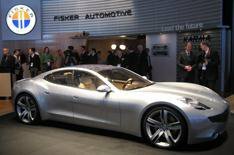 Scheduled to go on sale in late 2009 for about $80,000 (around 45,000), the car is a totally in-house Fisker design.